Ask any kid what their favorite subject in school is and they will grin ear to ear and tell you it’s lunch. While we grown-ups understand that lunch isn’t technically a subject, it’s the only thing on our children’s minds after about 9:30 a.m. 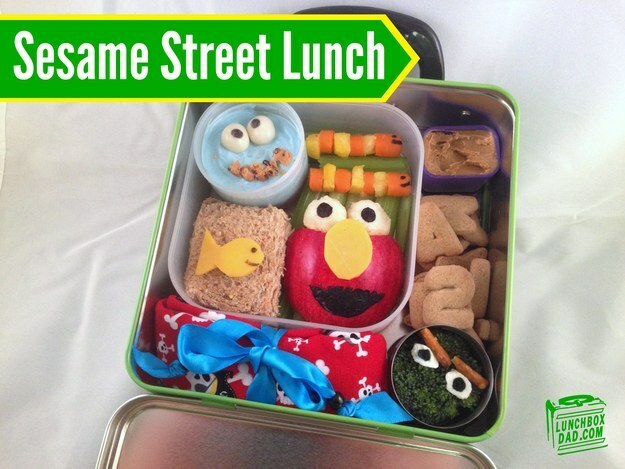 I remember growing up and feeling like lunch was the most important time of the day. It was the one thing in school other than the Book Mobile that I looked forward to. My friends and I swapped apples for raisins, PB&J for tuna salad, and chips for pretzels like it was our job. Lunch was a childhood phenomenon all on its own. From the characters on your lunchbox to whether you bought chocolate milk or had a juice box, lunch was life. A lot has changed since the good old days when my BeeGees flip-top thermos were the talk of the town. Nowadays school lunches are overseen and scrutinized by The First Lady herself. Unfortunately, her attempt to make school lunches healthier, tastier, and more appealing to the masses was an epic failure. While Michelle Obama had good intentions, the kids weren’t buying it and started posting pictures of their “less than edible-looking” school lunches on Twitter with the hashtag #ThanksMichelleObama . 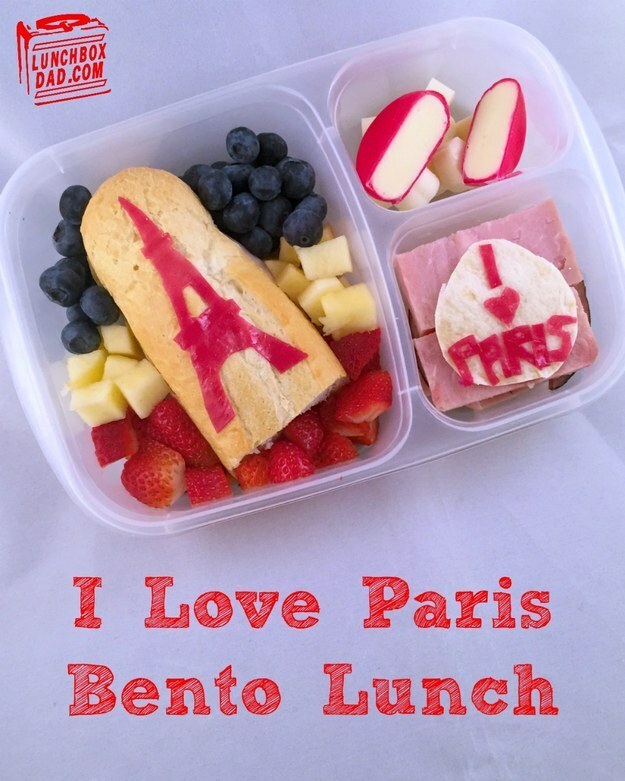 There is, however, a really cool Dad who runs a blog called Lunchbox Dad who knows just how to make lunch the event kids spend all morning looking forward to. 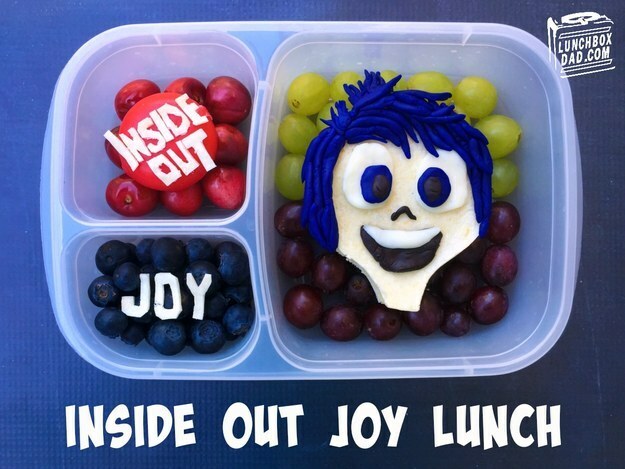 Inspired by his kid’s latest interests, this dad made packing lunches into an art form. 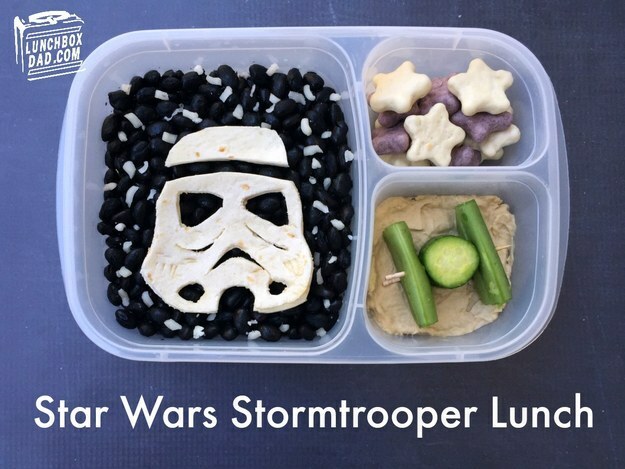 He creates movie characters out of food and packs it in lunches for his kids. 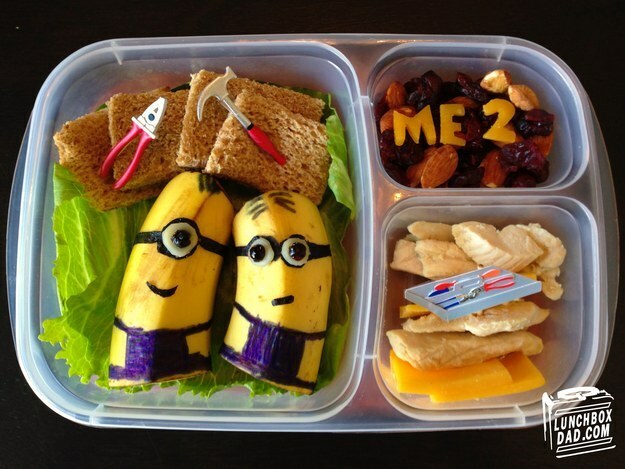 He has made banana minions, unicorn sandwiches, and even has movie themed lunches. He says all of the extra work is more than worth it to make memories for his kids and provide them with a nutritious lunch. Most parents I talk to, however, say that their kids buy lunches at the school because they simply don’t have the time to pack lunches during the hectic morning rush much less throw in a cast of characters made from carrots and hummus. We sympathize with parents and know ourselves how difficult it is trying to find time to get it all done. Along with time constraints, parents I have spoken with voice concerns over the types of food being offered in their children’s cafeterias. I’ve eaten lunch at my children’s schools and have experienced first-hand what is being offered in cafeterias across the country. I have also seen how much food gets wasted because kids simply don’t like it. Imagine sending your child to school and trusting that they were going to be provided with a healthy, delicious, affordable lunch that they would thoroughly enjoy. This is where The Lunch MOB comes into play. We are a unique company that works with area schools to help provide exceptionally healthy meals for kids. The Lunch MOB meals are freshly prepared every day and can range anywhere from your child’s favorite of PB&J to a soup and salad combination. With over 60 menu items to choose from, there is definitely something for everyone. Let us do the grocery shopping, planning, cooking, cleaning up, and delivery while all you have to do is place your order. Imagine how much better you would feel knowing your children were receiving proper nutrition during their busy day. If this sounds like something you would be interested in incorporating into your school, please don’t hesitate to contact us today. We would be happy to go over our menu options, pricing, and any questions you may have. Don’t allow your children to settle for being served another meal that will end up in the garbage. Call The Lunch MOB today. Usually, parents find it difficult to prepare quick and easy snacks for kids who attend school on a daily basis. Whether you’re a single parent, both of you work full time, or simply have a busy schedule, it’s understandable why parents often reach for and prepare the boring and dreaded old brown bagged lunch. For this reason we have come up with six fast, healthy, and simple snacks ideas that not only will provide the nutrients for the growing bodies and minds of your children, but also snacks ideas they will love! Put down the brown bags and let’s get started with helping put together some fresh school lunches for your kids. It is time you should replace those unhealthy, mid-day snacks with healthy options for your kids so they remain happy and active at all times. It is advised that every parent gives their children of any age fresh school lunches that have moderate amounts of calories in order to keep them healthy. The whole grain cereal meal incorporates essential nutrients such as, calcium, fiber, and vitamins. A bowl of improved whole grain with fruit and milk is an energy packed, healthy snack that will help the kids start their day with an energized smile. 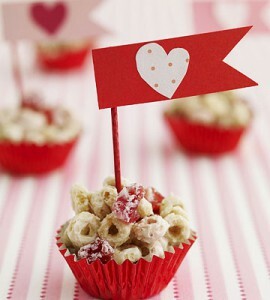 For an appetizing fun twist, try combing whole grain cereal with yogurt and dried strawberries. Cheese is a kid-friendly snack and contains the protein content that helps to boost energy and hold kids over until dinner time. When preparing this yummy snack be sure to choose salt-free and low-fat cheese. Create some fun by cutting the cheese into your child’s favorite Disney character or possibly their beloved Super Hero with a shaped cookie cutter. 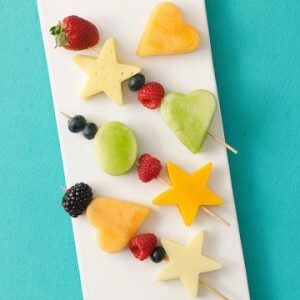 Kids go wild over these yummy treats that are packed with vital nutrients and nourishment that their growing bodies and minds need. 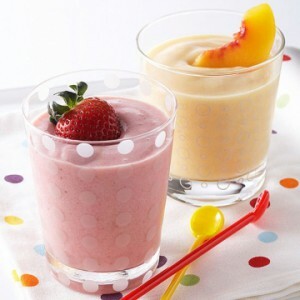 Try non-fat vanilla yogurt, banana, and pure orange juice as the base of the smoothies. Then add a mixture of frozen or fresh fruits to give it a bit of a kick. Want to be a little sneaky? Add in frozen or fresh spinach. Be careful not to add too much of the veggies since most kids have great taste buds and are able weed out any veggie push. Start with small amounts and build up overtime to get them familiar with the healthy tastes and they will begin to enjoy this combo even into their college and adult years. If they ask why it’s green, convince them it’s special HULK juice that only the strongest kids on the block drink! This is a wonderful way to include more than two servings of fiber, fruits and veggies into your kid’s regimen. As parents we usually like grabbing the easy to handle and longer shelf life fruits, such as bananas and apples. Although these fruits have longer self life they do not compare to the rich vitamin C that kids will receive from consuming strawberries. A cup of strawberries surprisingly contains more vitamin C than an equal portion of oranges. Strawberries also contain a healthy dose of folate and other nutrients that help kids maintain a healthy heart. Another benefit to this super fruit is that it also has been known to naturally whiten teeth. Instead of the boring old Peanut Butter and Jelly, why not give a bit of flare to this old staple. Resist the urge to reach and grab the jelly next time and put fresh slices of strawberry in the sandwich instead. 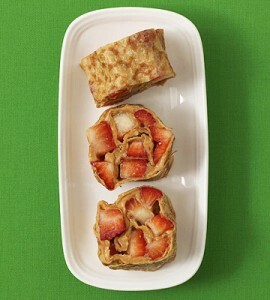 Fresh strawberries are a great substitute to jellies that contain too much sugar. 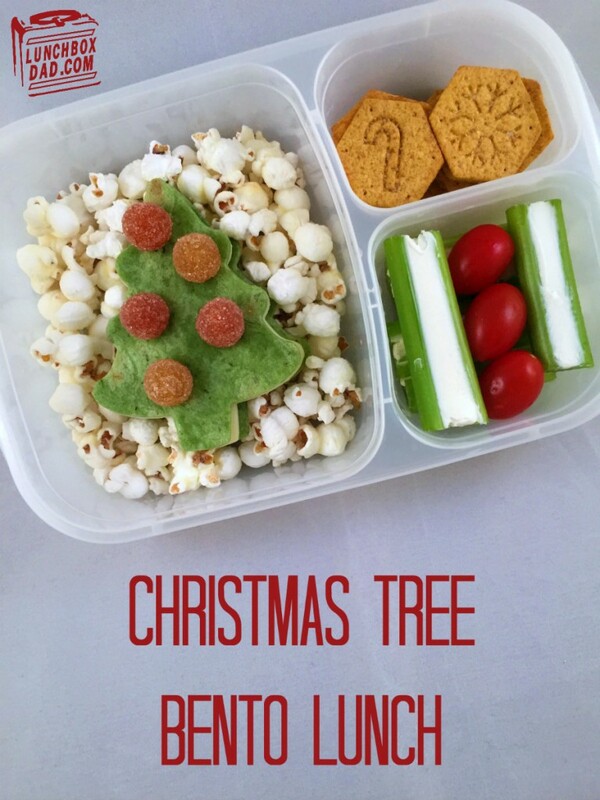 Not only is this a great snack idea, but it can also be put into your kids fresh school lunches. 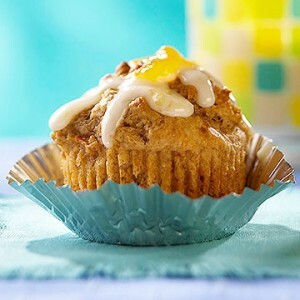 Muffins are a great vehicle for parents to use as a way to sneak in some healthy veggies. The strong flavors of veggies can be masked by fruit and other ingredients such as in baked goods and your kids never have to know the real ingredients. Carrot bars, banana bread, and zucchini muffins are among some of the top picks for kids and baked goods with added veggies. If you really want to throw your kids off the scent, why not give them Sweet Potato Brownie Bites? Not even adults will be able to tell the difference with this craft creation. 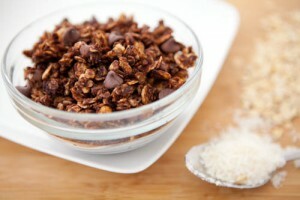 Kick your boring old granola routine up a notch with this Chocolate Coconut Granola from The Lunch MOB. Let’s face it, as parents we don’t always have time, even though we have the best intentions, to provide the healthy snack options for our kids. That’s where The Lunch MOB comes in, by providing fresh and daily made healthy options that kids actually love! This version of the classic adult favorite has been converted for kids of all ages to enjoy. Oats, shredded coconut, cocoa powder, ground flax seeds, extra virgin coconut oil, and mini chocolate chips. A protein and fiber-rich homemade snack that your kids will love, while providing the nutrients they need to make it through their school day. For more information and helpful tips on fresh school lunches for your school kids, keep checking back as we will be posting more ideas in this series of healthy and nourishing snack ideas that your kids will actually eat and love. To learn more about The Lunch MOB and how they can help you do away with the boring and dreaded bagged lunches, visit their site at www.TheLunchMOB.co.